MALPASSE, Haiti -- In October, three Haitian men were shot dead and a fourth was wounded just across the Dominican Republic border from this dusty and impoverished town. The men were gunned down, investigators say, by vigilantes or a rival criminal group for cutting down trees for charcoal. The remains of the three dead men were found burned inside the very furnaces they were using to produce Haiti's most sought-after fuel. The episode was the most violent recent confrontation between people along the border and a sign of worsening tensions, with Haiti's environmental problems sprawling into the Dominican Republic. The spread of deforestation, land degradation and erosion across the border is the surest sign yet that Haiti's ecology is being pushed to its limits. After years of political instability, Haiti now struggles to reverse the environmental damage caused by its growing population and widespread charcoal use. This E&ETV/Greenwire slide show examines Haiti’s political struggles and environmental challenges. Click here to watch the slide show. "The incursions into Dominican territory are creating pressure," said Max Antoine, director of Haiti's border development commission. 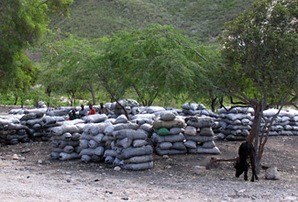 "The Haitians are creating pressure on their land, creating pressure on their economic space. ... It's a competition between the Haitians and the Dominicans." Haiti has lost 98 percent of its forests to destructive land use, mainly from the clear-cutting of trees for charcoal production. As vegetation disappears from Haiti, an illegal market for charcoal from the Dominican side is exploding. The Dominican Republic long ago banned the production of charcoal to protect its forests and began subsidizing propane to wean its population from fuel wood. But that has not stopped desperate Haitians from risking their lives for more charcoal, which provides more than 60 percent of their nation's energy. Conservative estimates put the weekly volume of illegal charcoal exports at 105,000 kilograms, or 115.7 tons, but the actual number is probably higher. Investigators say they know of at least 10 truckloads that cross the border every week. As Santo Domingo struggles to get a handle on the problem, Dominican authorities say they are getting little help from the Haitian side of the border. "We don't have the support from the government of Haiti," said Héctor Garibaldis Perez, an environment director for the border province of Jimani. "We are trying to make all possible efforts to face this situation." The Jimani murders led to a crackdown. Days after the shootings, 46 Haitian charcoal traffickers were rounded up in Los Haitises National Park, a protected zone deep in Dominican territory just north of Santa Domingo. The Environment Ministry said the group had "wrought enormous damage to the flora, fauna and water resources of that important protected area," according to the English daily Dominican Today. The Dominican army was also deployed to the border region to destroy charcoal furnaces and stop trucks from carrying charcoal to Haiti. And last month, a Haitian man was shot dead in an altercation with a Dominican border guard near the Haitian town of Anse à Pitres. But Dominican officials say their efforts have stemmed the trade by no more than 30 percent. Perez, who is heavily involved in investigations into the illegal charcoal trade, said no one can say for sure who is behind the trafficking, but officials believe that a network of cartels has emerged to drive the trade. Both Haitians and Dominicans alike are suspected of involvement. The island of Hispaniola is still marked by a famous dividing line seen prominently in satellite photos: brown, deforested Haiti on one side contrasted with lush green Dominican Republic on the other. But brown patches are now spreading into the Dominican side. "What I've noticed to the north of Jimani ... is essentially Haitian land-use practices marching further and further into the Dominican Republic," said Scott Sabin, executive director of the Christian nonprofit Floresta USA. "The land is being completely and progressively cleared." Floresta is devoted to spreading environmentally friendly land-use practices as a means to combat poverty. Its efforts include sustainable agro-forestry and the "Plant with Purpose" reforestation effort. The California nonprofit actually first began work in the Dominican Republic but eventually migrated to Haiti as it saw environmental degradation there spilling over. The border crossing at Malpasse, the most direct route between Hispaniola's two largest cities. Steps away Lac Azuei is rising, threatening to permanently close this checkpoint. Photo by Nathanial Gronewold. Sabin said the Dominican Republic's deforestation problem is not only related to the charcoal trade. Dominican landowners are letting impoverished Haitians share crops near the border, he said, and Haitians quickly revert to their practice of clearing trees for charcoal. And with Haitian labor dirt cheap, Dominican landowners have allowed sharecroppers to abuse their properties, he said. Floresta has planted about 350,000 trees in the border region and is scrambling to find alternative means of employment for the Haitians, but the lack of any strong central authority in Haiti has made its task extremely challenging, Sabin said. "I lost track of how many governments I've seen go by," Sabin said. "I have seen almost zero impact outside of Port-au-Prince of any of them, because they don't have the money, they don't have the power, they don't have the attention span." Antoine, Haiti's border commission director, is trying to change how things are done in his zone of influence. 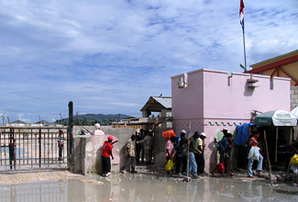 Haiti's border with the Dominican Republic is among the poorest parts of the country. Though Malpasse is a major border-crossing point lying along the most direct route between Port-au-Prince and Santo Domingo, this town is little more than a collection of wood and tin shacks and market stalls. Antoine's group has recently gained support from the Canadian government, which is pouring funds into developing the border region. Malpasse now hosts a modern customs and immigration-processing center built with Canadian money. Other facilities are slated for Belladère farther to the north of here and for Anse à Pitres in the extreme southeast. The commission hopes that by modernizing and formalizing these border crossings, the region will attract greater and more diverse economic activity on both sides, creating desperately needed jobs. Though clamping down on illegal charcoal trafficking can have some impact, only alternative sources of income will ultimately put an end to the practice, Antoine said. Mounds of charcoal smuggled from the Dominican Republic awaits shipment to Port-au-Prince. Dominican authorities are attempting to crack down on the trade but there is zero enforcement on the Haitian side. Photo by Nathanial Gronewold. "It's important to concentrate more funds on activities on the Haitian-Dominican Republic border so that we can provide jobs and create more work," Antoine said. "We need rapid intervention from all the actors working at the border so that we can restore the environment and protect the people living in the area from hurricanes and storms." The Haitian border commission is also interested in establishing a special economic zone to run the length of the border. Antoine is traveling frequently to the Dominican Republic to discuss the plan with private-sector actors there and is reaching out to the Dominican government for support. But Perez and his team say the Haitian government must first immediately establish a program to replace charcoal with propane and other alternative fuel sources, the same solution that saved Dominican forests from the fate suffered by the Haitian forests. Meanwhile, as the illegal charcoal trade exacerbates tensions between the two countries, the ecological damage done to Haiti's landscape threatens to pull the neighbors further apart in another unexpected way. Rapid erosion caused by deforestation is spilling large quantities of silt into Lac Azuei, raising lake levels and flooding the road connecting Port-au-Prince to Malpasse. The original road already lies 2 feet below the water line, but the government has been piling sand on top of it to keep the critical passage open. The lake is rising still. The government is considering reforesting the hillsides to halt the erosion and dredging the lake and a drainage canal, but thus far, its best hope for a permanent solution is a plan to build a new road on the north side of the lake. That project would cost at least $40 million, and there is no source of funding yet. But there are growing signs of hope in Haiti. The population seems more receptive than ever before to messages promoting environmental protection, aid workers and U.N. officials say. Storm barriers are springing up to protect urban centers from deadly flash floods, and community groups are experimenting with alternative sources of fuel. Safety and security seem to be improving, as well, encouraging Haitians to venture out more and tying the nation more closely together. That security is also giving space for the government and nonprofits to focus on solutions to the country's numerous environmental challenges. But Ron Daniels, founder of the New York-based Haiti Support Project, warns that the nation's stability is still fragile. U.N. peacekeepers and aid workers can only do so much, and the country's political leaders have yet to end their zero-sum game for dominance and come together, he said. "Given the right political scenario -- I mean by that the political class deciding that it's in its self-interest to embrace the masses of the people and to have progressive policies and so forth -- then this country is going to emerge as a dominant force, at some point, in the Caribbean," Daniels said.